Plastic is an invention that turned into Frankenstein’s monster. Benefits of plastics are undeniable; they are economical, portable and durable. But this advantage (extended durability) has now become its greatest disadvantage. India generates about 15,000 tonnes of plastic waste per day and contributes to 8 per cent of the total solid waste generation. The problem, however, is not the quantity of waste generated, but the fact that only 60 per cent of it is processed and the remaining 6,000 tonnes of unsegregated and littered waste remain scattered in our neighbourhoods and landfills, creating unpleasant sights, clogging drains and releasing greenhouse gases, especially methane. Collection of plastics in an uncontaminated form by the local bodies is a challenge and involves additional overheads in most of our cities, primarily due to lack of waste segregation mechanism. In 2016, the concept of Extended Producer Responsibility (EPR) was introduced into the Plastic Waste Management Rules, 2016. EPR is a practice and policy approach in which producers are made responsible for collecting and processing their manufactured products upon end of their lifetime. Responsibility may be fiscal, physical or a combination of both. EPR can be a blend of economic (shift responsibility of cost of disposal to producer), environmental (design recyclable products and discourage use of toxic components), and social factors (meet increasing consumer demand for environment-friendly products or those manufactured using recycled content). So far, its implementation in India is far from satisfactory, except some producers, who have been voluntarily collecting and recycling the waste generated by their products. But with no appropriate systems in place, take-back of products has become a challenge. However, there is a shift in wave with numerous Producer Responsibility Organisations (PROs) now coming into the picture. A PRO is a third-party organisation that facilitates the responsibility of producers to take back waste from open market, recycle or process, and file compliance. With a PRO, producers do not physically take back the product, but instead support the process financially. The cost of reverse logistics and compliance are high for an individual producer and creates an opportunity for PROs to work with multiple producers. PROs source waste from self-owned collection centres through the informal sector. Additionally, they also operate through franchisee-driven sourcing centres, which reduce transaction costs. In general, the obligation to recycle is transferred to a certified recycler. In few instances, these recyclers also operate as PROs by instituting their own collection channels. So far, PROs have been tried and tested when it comes to managing e-waste. Their roles and activities are defined in the guidelines for PRO under e-waste management rules. But, PRO does not find a mention in the Plastic Waste Management (Amendment) Rules, 2018. Meanwhile, CPCB has started registering PROs for plastic waste management. Recently, PepsiCo India committed to work toward collecting and recycling PET plastic waste generated in Maharashtra. It has forged a partnership with Gem Enviro (PRO) to set up infrastructure for collection and recycling. 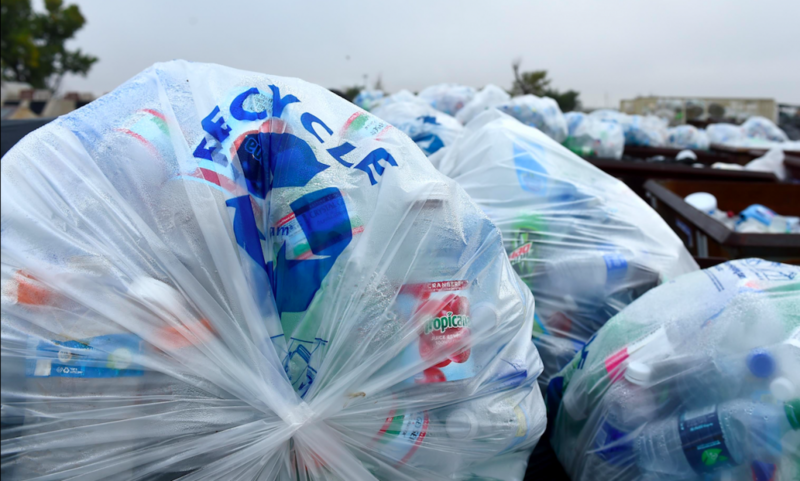 The PET bottles would be recycled to manufacture thermal wear, furnishing fabrics and carpets. PET waste will be sourced through developed network of scrap dealers and contractors, who, in turn, work through informal ragpickers. Gem Enviro is known for following a technically advanced process of reverse logistics and sourcing PET waste through automated reverse vending machines. The quality of waste sourced through this chain is also known to be of high quality. In addition, Gem Enviro associated with Ganesha Ecosphere Ltd (GESL) as the collection and recycling partner. GESL sources raw material through a pan-India network of more than 20 collection centres. PET waste at collection centres are further sent for processing. This established network enables collection of about 225 tonnes of PET waste daily. But, is there a possibility of unhealthy competition by unprofessional PROs? “Transparency in cost structure would be your winning goal in a competition. It is up to the producer to decide whether he needs actual waste processing or an on-paper compliance, which will be caught in no time,” says Arun of Saahas Zero Waste (SZW), which is a name in the field of reverse logistics, collecting plastics through extensive network of informal sector in Bengaluru, Gurugram, Chennai, Hyderabad, Surat, Bellary and Hubli. SZW has a strong collection model involving scrap dealers and informal sector of waste collectors who ensure collection of large quantity of tetra paks. Material recovery facilities (MRF) are the secondary aggregation and segregation point. Secondary segregation of paper, glass, metal and plastic is done at the MRF. Plastic is further segregated into 16 categories to increase sale value. SZW acts only as a collection partner and forwards the materials to Tetra Pak on reaching threshold (holding capacity of MRF). This model is a perfect example of strengthening existing value chain to ensure efficient sourcing of waste. Waste Venture is a PRO operating from Hyderabad and offers PRO solutions for a leading FMCG. The collection chain is driven by web app and on-call demand-based collection from residential and commercial establishments. This is further supported by nearly 30,000 informal waste collectors associated with the PRO. Waste Ventures created a database of these waste pickers, provided social identity, infrastructure and training on safe and hygienic way of handling waste. This ensured supply of quality raw material from these informal waste collectors at lower rates compared to an aggregator. Europe has set precedent when it comes to plastic-generating corporations establishing PROs to collect plastics and facilitate processing. Long-term agreements are facilitated, enabling PROs to establish infrastructure for collection, guaranteed by secured reimbursements from the brands liable for collection as per the policy. Sweden follows one of the most robust waste management systems in the world, with less than one per cent of its household waste ending up in landfills. Extensive presence of recycling stations and stringent implementation of source segregation leads to successful plastic waste management. The PROs operational in the country are the best examples of why mainstreaming informal sector is a viable solution and how it brings two major reforms: formalisation of informal sector and standardisation of wage in informal sector. “PRO would experience great challenges on the ground due tolow level of source segregation,” says Abdul Rahman of Waste Ventures. Indiscriminate scattering of products, some of which are not produced by a known brand, makes it even more challenging. For instance, a waste picker would collect waste that would give him more earning rather than low-value plastic with high volume. The Plastic Waste Management Rules specify that the manufacturer is to develop a mechanism to collect back the plastic waste in collaboration with the local bodies. The manufacturers are process-oriented entities with a formal structure. The readiness of ULB to work in tandem with the manufacturers, considering the grassroots-level challenges and existing infrastructure deficit is not completely certain. A forced collaboration might not be required. Success would lie in creating a strong monitoring and reporting structure for both PROs and recyclers. A real-time assessment and mapping of supply by producer and state-wise consumption is required to determine the realistic and accountable EPR. Guidelines for registration as PRO and the roles of each stakeholder are to be clearly drafted and enforced by the legislature. “PRO has to invest in a collection channel that would ensure continuous flow of high-quality source material. Instead of reinventing the wheel, the optimal solution would be to invest in the existing channel. The knowledge persisting in the informal sector is enormous and needs to be captured,” says Pranshu Singhal, founder of Karo Sambhav—a Gurugram-based PRO. With a strong network of informal sector, PROs can address the need for cost-effective collection of waste and safe disposal.